Every Saturday in the Fall, Manhattan, KS comes alive when the Wildcats are at home at Billy Snyder Family Stadium. From 1924 until 1967 the team played at Memorial Stadium. By the mid 1960s, the stadium began showing its age and the Wildcats needed a new modern facility. Over $1.6 million was raised in order to construct Bill Snyder Family Stadium. The Wildcats played their inaugural first game at the stadium on September 21, 1968 when they battled Colorado State. The stadium was originally known KSU Stadium and had a capacity of 35,000, but that soon changed as the stadium was expanded two years later. Nearly 4,000 permanent stands were added on the east side, while 3,000 temporary stands were placed on the west side of Bill Snyder Family Stadium in 1970. Like many teams during the 1970s the Wildcats switched the playing surface at the stadium from grass to Astroturf. By the 1972 season, locker rooms and athletic offices were constructed at the north end of the stadium. In 1983 the Wildcats were able to play at night as lights were installed. In the 1990s Bill Snyder Family Stadium was upgraded. A new five story press box with luxury suites was built in 1993 and three years later a new state of the art video/scoreboard was installed. Perhaps the largest expansion at Bill Snyder Family Stadium was completed before the 1999 season when the upper deck on the east side was built. 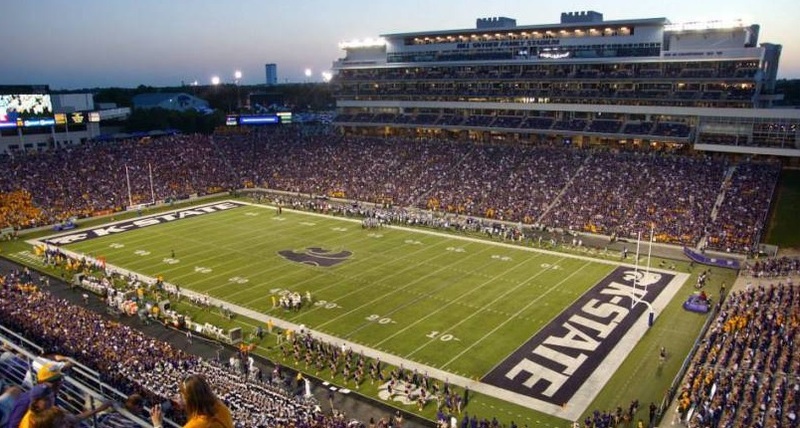 This expansion also included the construction of 31 new luxury suites and increased the seating capacity of Bill Snyder Family Stadium to 50,300. During the 2005 season the stadium was named Bill Snyder Family Stadium after KSU Coach Bill Snyder. In 2006 $5.6 million was spent on new locker rooms and expanded seating into the north endzone. A new 23’x 61′ HD video/scoreboard was installed in 2007. Prior to the start of the 2013 season, the press box and club seats were demolished on the west side of the stadium. Replacing it, a $75 million structure that spans the length of the field and houses a new press box, 41 luxury suites, 700 club seats, wider concourses and a Hall of Honor. In April 2014 the Wildcats unveiled plans for a $68 million renovation to the north end of the stadium. This project doubled the size of the Vanier Football Complex and was completed by the 2015 season. The second phase, finished prior to the start of the 2016 season, includes a 360-degree concourse around the stadium and two massive video-boards on each end of the facility.